You know, food helps relieve back pain. Just sayin'. Your little beagle is your best pal—always happy and full of fun. You hate to see your buddy in pain, but beagles are prone to certain back and hip problems. Sometimes the signs are subtle, while with others he's obviously hurting. Your vet can help him feel better. Your dog's discs are similar to cushions between the spine's vertebrae. Discs have a tougher outer layer and a jellylike inner layer. As your dog goes about his daily beagle business—running, jumping, chasing squirrels—discs cushion his spine. As he ages, they might start breaking down. The squishy material in the inner layer becomes harder. As the discs become less flexible, they start sticking out between the vertebrae. In a worst-case scenario, the disc ruptures. In both cases, the spinal cord may be affected. Symptoms of intervertebral disc disease run the gamut from mild to severe. 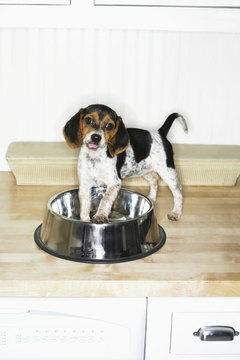 Your beagle might have difficulty walking or appear in pain, or he could be completely paralyzed. IDD can occur suddenly or over time. If it happens overnight, the disc probably ruptured. When IDD happens over time, you might notice that you don't have to scold your beagle for jumping up on furniture, because he's not doing it anymore. He might not want to go up or down stairs, or could cry out when you pick him up. Take him to the vet for a diagnosis, which may require magnetic resonance imaging, or MRI. Even in the worst-case scenario of a ruptured disc and paralysis, surgery involves fairly good odds of your beagle walking again. After surgery, he will need physical therapy for a while, and probably can't go back to normal activities for several months. In milder cases, your vet may prescribe steroids to ease inflammation and strict rest for two weeks or more. Your beloved beagle can't run around in the backyard, but must be walked to "do his business" and then back to a restricted area. 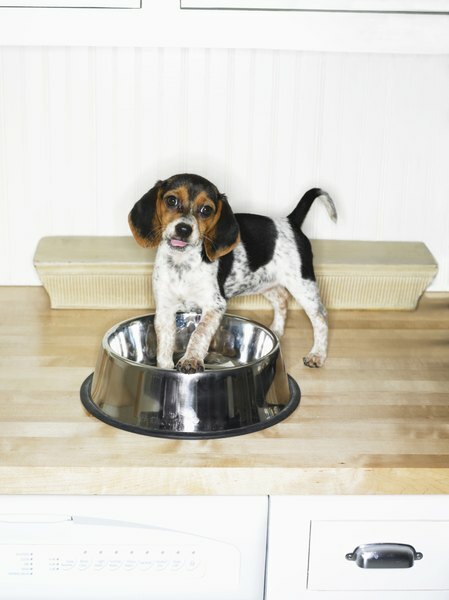 If he's crate-trained, that may help keep him inactive, or your vet can prescribe sedatives. It may be hard for you to see him in this condition, but remember it's for his own good. Soon he'll be outside playing and smiling his goofy beagle grin. In both mild and severe cases, use a harness in the future when walking him, rather than attaching the leash to the collar. This way you can't accidentally tug on his neck. While this malformation of the hip joint more frequently occurs in larger breeds of dogs, smaller canines like the beagle also experience it. Dogs with hip dyplasia may begin limping, often at a young age, and also suffer from arthritis. If your beagle hasn't had hip X-rays, you might assume that he just has arthritis. Your vet can prescribe medication to ease the symptoms. In serious cases, she can perform surgery to help your dog regain mobility. Is the Carpet Safe for Pet Birds After a Termite Tenting?